Half Empty is one of Dr. Crygor's microgames in WarioWare: Twisted! It returns in WarioWare Gold as one of Penny's microgames. 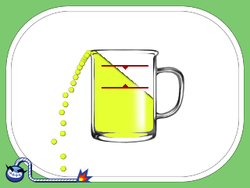 The game's purpose is to reduce the water level until it gets between the two red arrows. 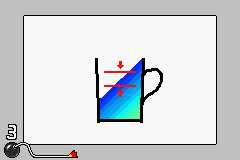 To do so, the player has to tilt the system to tip the container. 1st level difficulty: The space between the arrows is large. 2nd level difficulty: The space between the arrows is a bit smaller. 3rd level difficulty: The space between the arrows is smaller. This page was last edited on October 29, 2018, at 21:28.